America's initial Stone Age inhabitants arrived here by traversing the Bering Strait, and over the centuries that followed a wide variety of Indian cultures developed and prospered across the land. Head of government: Barack H. Obama is the 44th President of the United States sworn in office January 20,2009 with Vice President Joseph Biden. Christopher Columbus is shown landing in the West Indies, on an island that the natives called Guanahani and he named San Salvador, on October 12, 1492. He raises the royal banner, claiming the land for his Spanish patrons, and stands bareheaded, with his hat at his feet, in honor of the sacredness of the event. The captains of the Niña and Pinta follow, carrying the banner of Ferdinand and Isabella. The crew displays a range of emotions, some searching for gold in the sand. Natives watch from behind a tree. After Christopher Columbus made his initial voyage to this New World, word of its potential riches spread across Europe, and explorers and settlers soon stepped ashore by the thousands, from Boston to Florida. John Cabot explored the North American coast for England in 1498. 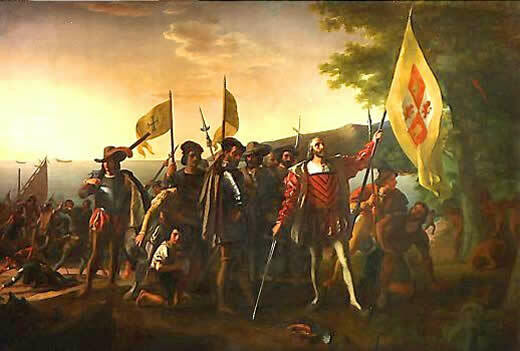 Men who were important explorers for Spain in what now constitutes the United States include Ponce de León, Cabeza de Vaca, Hernando De Soto, and Coronado; important explorers for France were Giovanni da Verrazano, Samuel de Champlain, Louis Jolliet, Jacques Marquette, and La Salle. These three nations—England, Spain, and France—were the chief nations to establish colonies in the present United States, although others also took part, especially the Netherlands in the establishment of New Netherland (explored by Henry Hudson), which became New York, and Sweden in a colony on the Delaware River . The first permanent settlement in the present United States was Saint Augustine (Florida), founded in 1565 by the Spaniard Pedro Menéndez de Avilés. The first permanent English settlement was made at Jamestown (Virginia) in 1607. The first English settlements in Virginia were managed by a chartered commercial company, the Virginia Company. Protestant pilgrims are shown on the deck of the ship Speedwell before their departure for the New World from Delft Haven, Holland, on July 22, 1620. 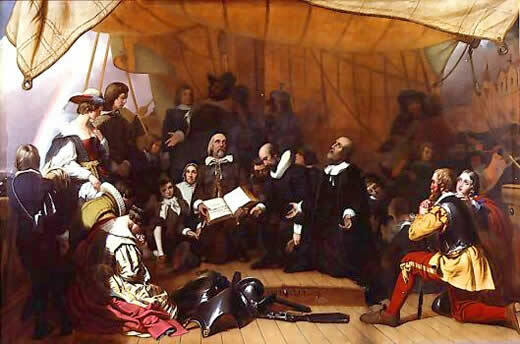 William Brewster, holding the Bible, and pastor John Robinson lead Governor Carver, William Bradford, Miles Standish, and their families in prayer. The prominence of women and children suggests the importance of the family in the community. At the left side of the painting is a rainbow, which symbolizes hope and divine protection. In 1620, the Pilgrims arrived on the Mayflower, landing in Massachusetts; their settlement named Plymouth survived, and the incredible story of a new nation was subsequently born. By 1650, however, England had established a dominant presence on the Atlantic coast. The first colony was founded at Jamestown, Virginia, in 1607. Many of the people who settled in the New World came to escape religious persecution. 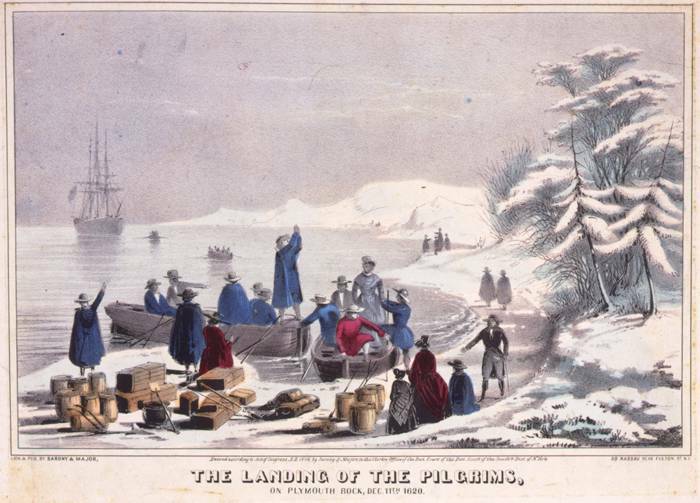 The Pilgrims, founders of Plymouth, Massachusetts, arrived in 1620. In both Virginia and Massachusetts, the colonists flourished with some assistance from Native Americans. New World grains such as corn kept the colonists from starving while, in Virginia, tobacco provided a valuable cash crop. By the early 1700s enslaved Africans made up a growing percentage of the colonial population. By 1770, more than 2 million people lived and worked in Great Britain's 13 North American colonies. Inevitable conflicts and wars over lands rightfully claimed by Indians and other established nations were followed by the Revolutionary War, as America and its upstart colonies broke from England and declared their new-found independence. Defending the Colonies against attack by the French and others had cost the British a great deal of money. As a result, the British had very high taxes in their country. They thus decided to shift some of their financial burden to the colonists. The Stamp Act of 1765, which taxed all legal documents, newspapers and other documents, was met with a great uproar in the Colonies. In 1766, this tax was repealed, but it was just the beginning of the problems between the colonists and the British. The Boston Tea Party in 1773 was an act of revolt against the British and their tax on tea in the Colonies. Tensions such as these eventually led to the writing of the Declaration of Independence in 1776. A year earlier, the War of Independence, also known as the American Revolution, began. When the British finally surrendered on October 19, 1781, Americans were officially independent of Britain and set about establishing their own government. Credit: Moran, Percy, artist. 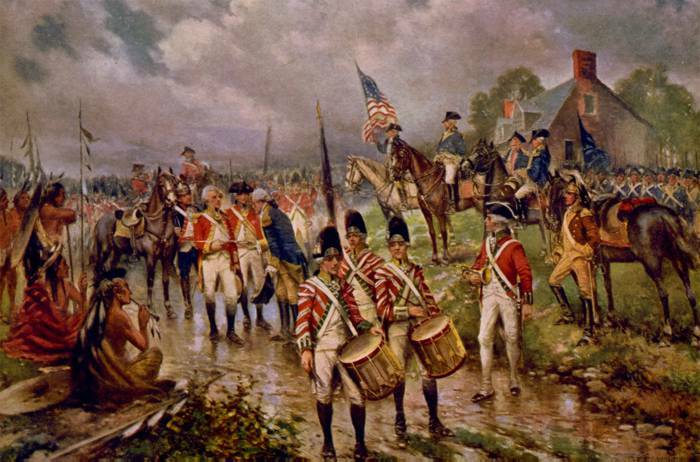 "Burgoyne's surrender at Saratoga." c1911. Prints and Photographs Division, Library of Congress. 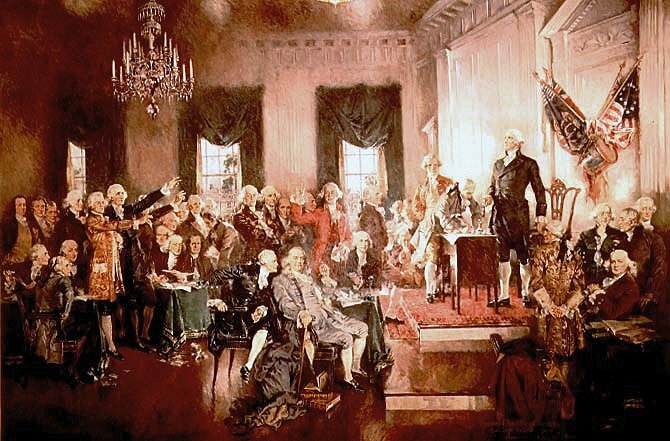 The American colonies were recognized as the new nation of the United States of America following the Treaty of Paris in 1783.On January 14, 1784, the treaty was ratified. The United States was officially an independent nation. George Washington—a renowned hero of the American Revolutionary War, commander and chief of the Continental Army, and president of the Constitutional Convention—became the first President of the United States under the new U.S. Constitution. America expanded rapidly, well beyond the reach of the original 13 colonies; the remaining indigenous Indians were stripped of most of their lands and moved to reservations; the central plains were purchased from Napoleon (The Louisiana Purchase-France); Florida was purchased from Spain, and the entire southwest (including California) was annexed after a successful war with Mexico - as the growing influence and size of the United States of America began to take shape. In response to continued British impressment of American sailors into the British Navy, President James Madison had the Twelfth United States Congress declare war on Britain in 1812. The United States and Britain came to a draw in the War of 1812 after bitter fighting that lasted until January 8, 1815. Settlers (pioneers) from the east spread west across the plains, all the way to California. Soon railroads - the driving engines of coast-to-coast commerce - were up and running; the economy exploded and towns sprang up across the land. Conflict over issues of how much control the federal government should have over the states, industrialization, trade, and especially slavery had increased tension between Northern and Southern states. After Abraham Lincoln was elected president in 1860, 11 Southern states seceded (or withdrew) from the Union and set up an independent government--the Confederate States of America. 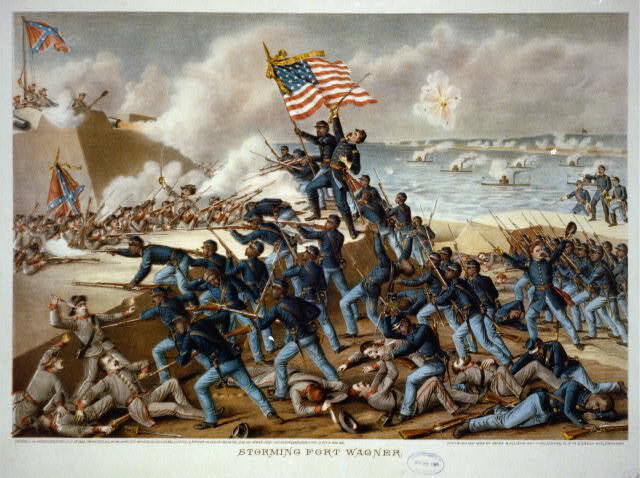 These events led to the outbreak of the Civil War--a brutal, bloody, four-year conflict that left the South defeated and ended slavery at the cost of more than half a million lives. 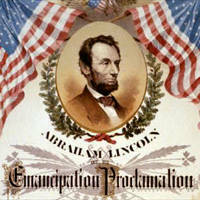 Lincoln's Emancipation Proclamation was issued on January 1, 1863. 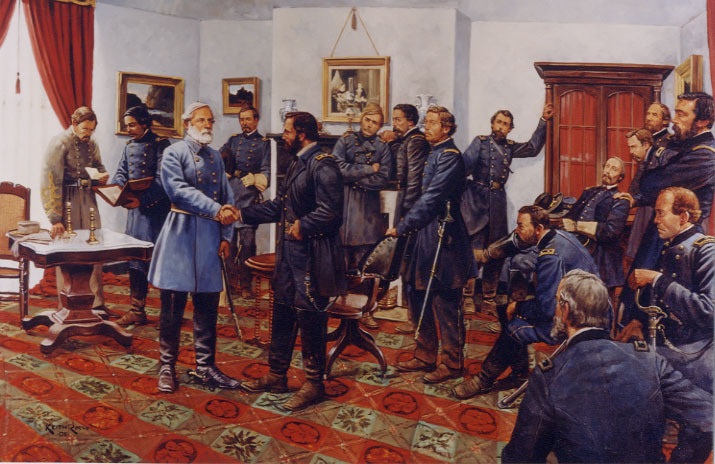 On April 9, 1865 after four years of Civil War, approximately 630,000 deaths and over 1 million casualties, General Robert E. Lee surrendered the Confederate Army of Northern Virginia to Lieutenant General Ulysses S. Grant, at the home of Wilmer and Virginia McLean in the town of Appomattox Court House Virginia. General Lee arrived at the Mclean home shortly after 1:00 p.m. followed a half hour later by General Grant. The meeting lasted approximately an hour and a half. The surrender of the Army of Northern Virginia allowed the Federal Government to bring increased pressure to bear in other parts of the south and would result in the surrender of the remaining field armies of the Confederacy over the next few months. After the Civil War, America experienced an accelerated rate of industrialization, mainly in the northern states. An unprecedented wave of immigration to the United States served both to provide the labor for American industry and to create diverse communities in previously undeveloped areas. At the start of the World War I in 1914, the United States remained neutral. In 1917, however, the United States joined the Allied Powers, helping to turn the tide against the Central Powers. During most of the 1920s, the United States enjoyed a period of unbalanced prosperity as farm prices fell and industrial profits grew. A rise in debt and an inflated stock market culminated in a crash in 1929, triggering the Great Depression. After his election as President in 1932, Franklin Delano Roosevelt instituted his plan for a New Deal, which increased government intervention in the economy in response to the Great Depression. The United States was driven to join the Allies against the Axis Powers after a surprise attack on Pearl Harbor by Japan. World War II was the costliest war in economic terms in American history, but it helped to pull the economy out of depression because the required production of military materiel provided much-needed jobs, and women entered the workforce in large numbers for the first time. During this war, scientists working for the United States federal government succeeded in producing nuclear weapons, making the United States the world's first nuclear power. Toward the end of World War II, after the end of World War II in Europe, the United States dropped atomic bombs(Little Boy&Fat Man) on Hiroshima and Nagasaki, Japan. The Hiroshima and Nagasaki bombs were the second and third nuclear devices detonated and the only ones ever employed as weapons. Japan surrendered on 2 September 1945, which ended World War II. Thereafter the U.S. was the military and economic leader of the Western world. In the first decade after the war, it aided the reconstruction of Europe and Japan and became embroiled in a rivalry with the Soviet Union known as the Cold War. It participated in the Korean War from 1950 to 1953. In 1952 it granted autonomous commonwealth status to Puerto Rico. Racial segregation in schools was declared unconstitutional in 1954. Alaska and Hawaii were made states in 1959. -- ask what can you do for your country." 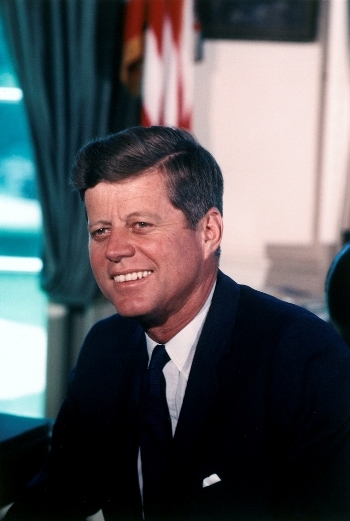 In 1961 the youngest President ever elected was John F. Kennedy. President Kennedy called for “new frontiers” of American endeavor. Kennedy's foreign policy combined such humanitarian innovations as the Peace Corps and the Alliance for Progress . On Nov. 22, 1963, President Kennedy was assassinated while riding in a motorcade in Dallas, Texas. 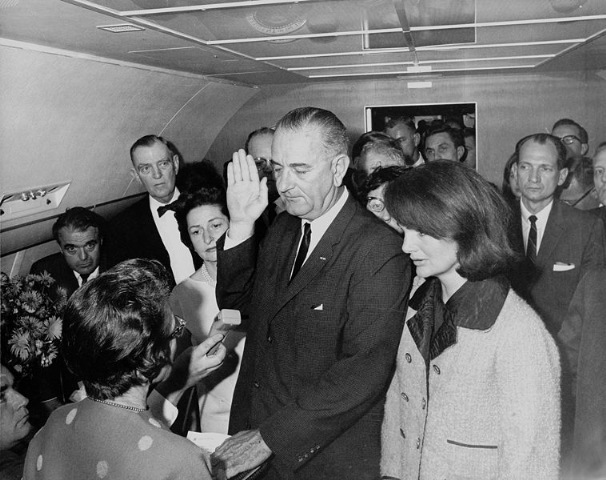 Lyndon B. Johnson was sworn in to become President in Dallas with Jacqueline Kennedy at his side. 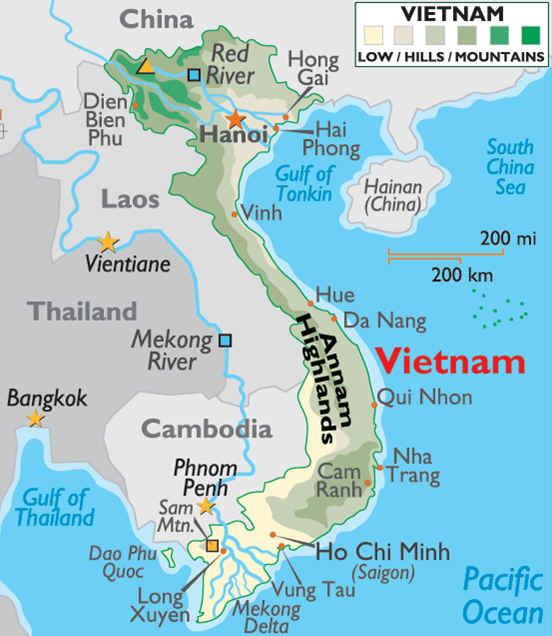 In 1964 Congress passed the Civil Rights Act and authorized U.S. entry into the Vietnam War. 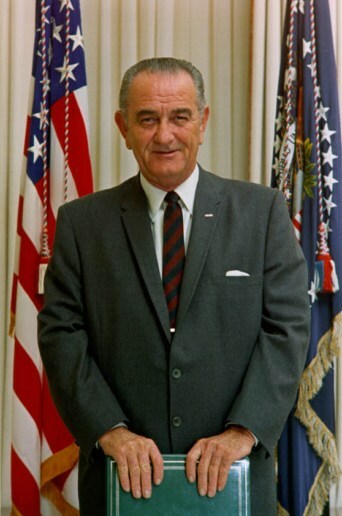 "A Great Society" for the American people and their fellow men elsewhere was the vision of Lyndon B. Johnson. The Great Society program became Johnson's agenda for Congress in January 1965: aid to education, attack on disease, Medicare, urban renewal, beautification, conservation, development of depressed regions, a wide-scale fight against poverty, control and prevention of crime and delinquency, removal of obstacles to the right to vote. The Civil Rights Act of 1964: In his first address to Congress and the nation as president, Johnson called for passage of the civil rights bill as a monument to the fallen Kennedy. While the House of Representatives passed the measure by a lopsided 290-130 vote, every one knew that the real battle would be in the Senate, whose rules had allowed southerners in the past to mount filibusters that had effectively killed nearly all civil rights legislation. But Johnson had the civil rights leaders mount a massive lobbying campaign, including inundating the Capitol with religious leaders of all faiths and colors. The strategy paid off, and in June the Senate voted to close debate; a few weeks later, it passed the most important piece of civil rights legislation in the nation's history, and on July 2, 1964, President Johnson signed it into law. The heart of the law deals with public accommodations, so that African Americans could no longer be excluded from restaurants, hotels and other public facilities. Under Johnson, the country made spectacular explorations of space in a program he had championed since its start. 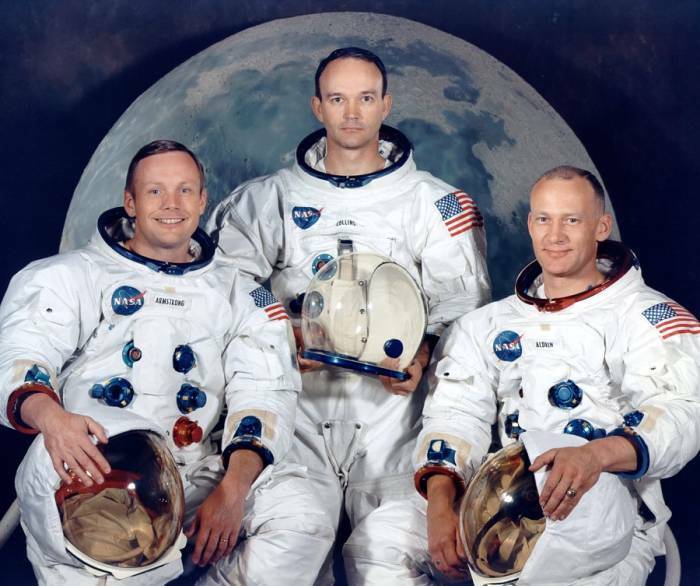 When three astronauts successfully orbited the moon in December 1968, Johnson congratulated them: "You've taken ... all of us, all over the world, into a new era. . . . "
Nevertheless, two overriding crises had been gaining momentum since 1965. Despite the beginning of new antipoverty and anti-discrimination programs, unrest and rioting in black ghettos troubled the Nation. President Johnson steadily exerted his influence against segregation and on behalf of law and order, but there was no early solution. The other crisis arose from Viet Nam. Despite Johnson's efforts to end Communist aggression and achieve a settlement, fighting continued. Controversy over the war had become acute by the end of March 1968, when he limited the bombing of North Viet Nam in order to initiate negotiations. At the same time, he startled the world by withdrawing as a candidate for re-election so that he might devote his full efforts, unimpeded by politics, to the quest for peace. The mid- to late 1960s were marked by widespread civil disorder, including race riots and antiwar demonstrations. The Vietnam War provoked discord across the nation, manifested in marches and demonstrations in which casualties were sometimes incurred and thousands of people were arrested. An impression of general lawlessness and domestic disintegration was heightened by serious race riots that erupted in cities across the nation, most devastatingly in the Watts district of Los Angeles (1965) and in Detroit and Newark (1967), and by various racial and political assassinations, notably those of Martin Luther King, Jr., and Senator Robert F. Kennedy (1968). Other manifestations of social upheaval were the increase of drug use, especially among youths, and the rising rate of crime, most noticeable in the cities. In 1968 Richard M. Nixon defeated Vice President Hubert H. Humphrey and third-party candidate George C. Wallace. Reconciliation was the first goal set by President Richard M. Nixon. The Nation was painfully divided, with turbulence in the cities and war overseas. 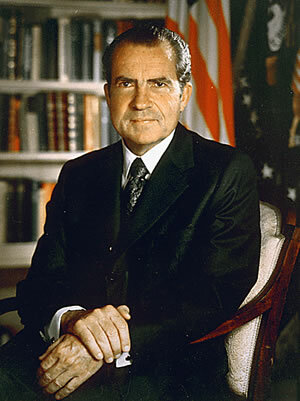 During his Presidency, Nixon succeeded in ending American fighting in Viet Nam and improving relations with the U.S.S.R. and China. 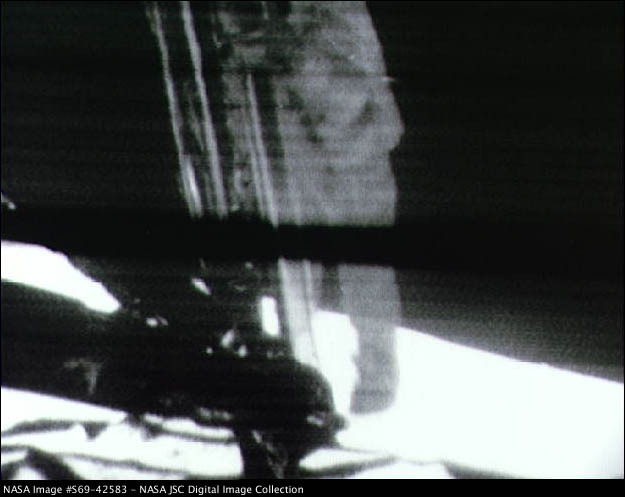 Neil A. Armstrong was the first man to step foot on the Moon. "That's one small step for a man, one giant leap for mankind"
All U.S. troops were withdrawn from Vietnam in 1973. President Richard M. Nixon was embattled over the "Watergate" scandal, stemming from a break-in at the offices of the Democratic National Committee during the 1972 campaign. The break-in was traced to officials of the Committee to Re-elect the President. A number of administration officials resigned; some were later convicted of offenses connected with efforts to cover up the affair. Nixon denied any personal involvement, but the courts forced him to yield tape recordings which indicated that he had, in fact, tried to divert the investigation. President Nixon announced on August 8, 1974, that he would resign the next day to begin "that process of healing which is so desperately needed in America." When Gerald R. Ford took the oath of office on August 9, 1974, he declared, "I assume the Presidency under extraordinary circumstances.... This is an hour of history that troubles our minds and hurts our hearts." It was indeed an unprecedented time. 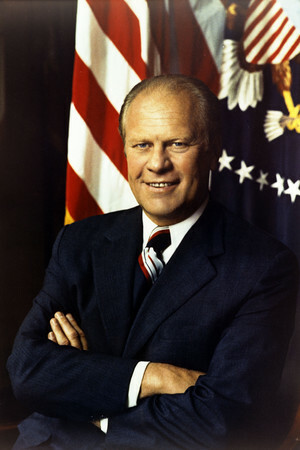 He had been the first Vice President chosen under the terms of the Twenty-fifth Amendment and, in the aftermath of the Watergate scandal, was succeeding the first President ever to resign. Ford continued as he had in his Congressional days to view himself as "a moderate in domestic affairs, a conservative in fiscal affairs, and a dyed-in-the-wool internationalist in foreign affairs." A major goal was to help business operate more freely by reducing taxes upon it and easing the controls exercised by regulatory agencies. "We...declared our independence 200 years ago, and we are not about to lose it now to paper shufflers and computers," he said. President Jimmy Carter worked hard to combat the continuing economic woes of inflation and unemployment. By the end of his administration, he could claim an increase of nearly eight million jobs and a decrease in the budget deficit, measured in percentage of the gross national product. Unfortunately, inflation and interest rates were at near record highs, and efforts to reduce them caused a short recession. 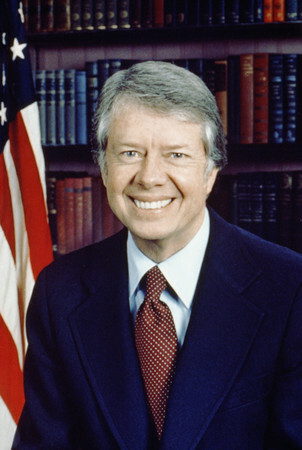 Carter could point to a number of achievements in domestic affairs. He dealt with the energy shortage by establishing a national energy policy and by decontrolling domestic petroleum prices to stimulate production. He prompted Government efficiency through civil service reform and proceeded with deregulation of the trucking and airline industries. He sought to improve the environment. His expansion of the national park system included protection of 103 million acres of Alaskan lands. To increase human and social services, he created the Department of Education, bolstered the Social Security system, and appointed record numbers of women, blacks, and Hispanics to Government jobs. 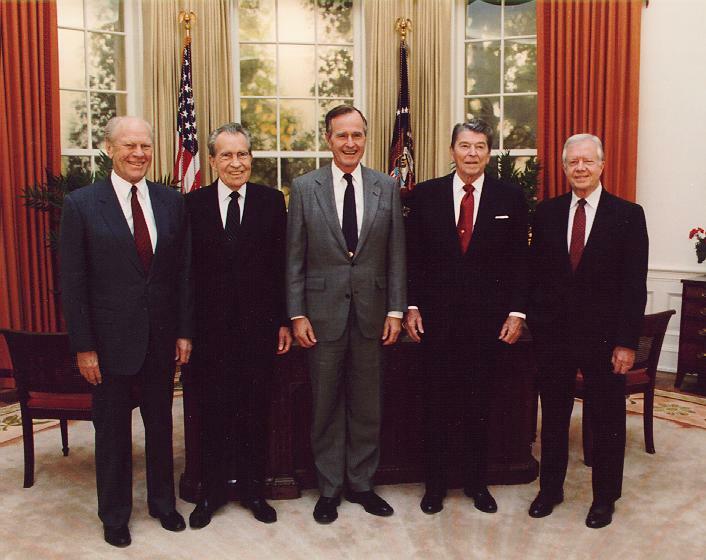 In foreign affairs, Carter set his own style. His championing of human rights was coldly received by the Soviet Union and some other nations. In the Middle East, through the Camp David agreement of 1978, he helped bring amity between Egypt and Israel. He succeeded in obtaining ratification of the Panama Canal treaties. Building upon the work of predecessors, he established full diplomatic relations with the People's Republic of China and completed negotiation of the SALT II nuclear limitation treaty with the Soviet Union. There were serious setbacks, however. The Soviet invasion of Afghanistan caused the suspension of plans for ratification of the SALT II pact. The seizure as hostages of the U. S. embassy staff in Iran dominated the news during the last 14 months of the administration. The consequences of Iran's holding Americans captive, together with continuing inflation at home, contributed to Carter's defeat in 1980. Even then, he continued the difficult negotiations over the hostages. Iran finally released the 52 Americans the same day Carter left office. 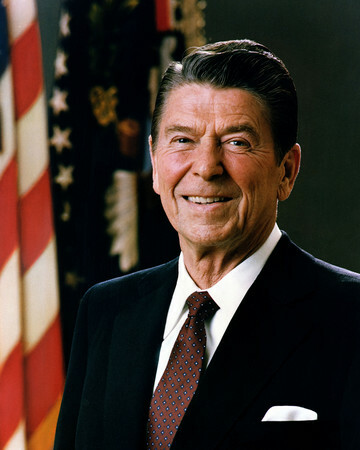 In 1980 Ronald Reagan was elected President at the age of 69. On March 30,1981 an assassination attempt was made on President Reagan By John Hinckley.
" I didn't know I was shot"
His persuasive quotable speaking style earned Reagan the title "The Great Communicator." A major focus of Reagan's first term was reviving the economy. The inflation rate dropped from 13.6% in 1980 to 4.1% by 1988, the economy added 16,753,000 jobs and the unemployment rate fell from 7.5% to 5.3%. In addition, the poverty rate fell from 14% to 12.8%. Reagan pursued a strategy of combining this tight-money policy with broad tax cuts designed to boost business investment. On November 20,1985 Microsoft released its first retail version of Microsoft Windows. The Personal Computer (PC) and Microsoft became an integral part of every day life starting in the United States during the late 1980's. On January 28, 1986,11:38:00 a.m. EST The Space Shuttle Challenger launched from the Kennedy Space Center. The seven-member crew was killed after a vehicle breakup which occurred 73 seconds after lift-off because of an O-ring seal failure in the booster system. President Ronald Reagan in an address to the nation described the tragedy as "a national loss". 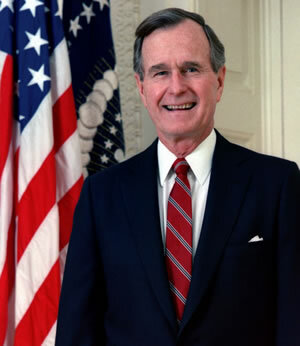 In 1988 Vice President George Bush won the Republican nomination for President and, with Senator Dan Quayle of Indiana as his running mate, he defeated Massachusetts Governor Michael Dukakis in the general election. President George Bush faced a dramatically changing world, as the Cold War ended after 40 bitter years, the Communist empire broke up, and the Berlin Wall fell. The Soviet Union ceased to exist; and reformist President Mikhail Gorbachev, whom Bush had supported, resigned. While Bush hailed the march of democracy, he insisted on restraint in U. S. policy toward the group of new nations. In other areas of foreign policy, President Bush sent American troops into Panama to overthrow the corrupt regime of General Manuel Noriega, who was threatening the security of the canal and the Americans living there. Noriega was brought to the United States for trial as a drug trafficker. Bush's greatest test came when Iraqi President Saddam Hussein invaded Kuwait, then threatened to move into Saudi Arabia. Vowing to free Kuwait, Bush rallied the United Nations, the U. S. people, and Congress and sent 425,000 American troops. They were joined by 118,000 troops from allied nations. After weeks of air and missile bombardment, the 100-hour land battle dubbed Desert Storm routed Iraq's million-man army. Despite unprecedented popularity from this military and diplomatic triumph, Bush was unable to withstand discontent at home from a faltering economy, rising violence in inner cities, and continued high deficit spending. In 1992 he lost his bid for reelection to Democrat William Clinton. 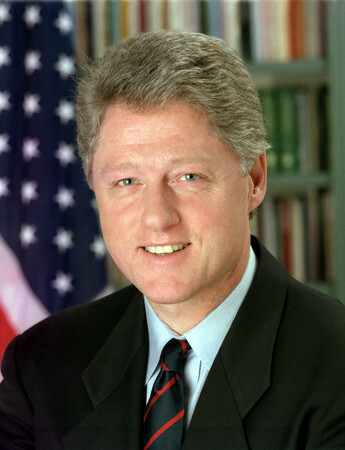 During the administration of President William Jefferson Clinton, the U.S. enjoyed more peace and economic well being than at any time in its history. He was the first Democratic president since Franklin D. Roosevelt to win a second term. He could point to the lowest unemployment rate in modern times, the lowest inflation in 30 years, the highest home ownership in the country's history, dropping crime rates in many places, and reduced welfare rolls. He proposed the first balanced budget in decades and achieved a budget surplus. In the world, he successfully dispatched peace keeping forces to war-torn Bosnia and bombed Iraq when Saddam Hussein stopped United Nations inspections for evidence of nuclear, chemical, and biological weapons. He became a global proponent for an expanded NATO, more open international trade, and a worldwide campaign against drug trafficking. Administration of the Panama Canal was turned over to Panama in 1999. 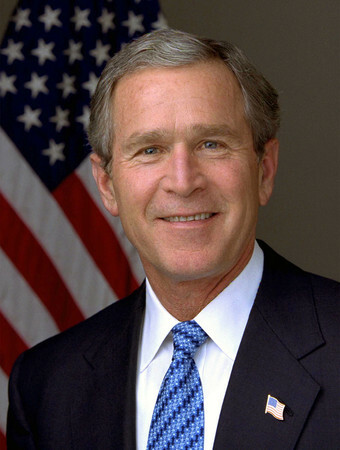 George W. Bush the 43rd President of the United States was sworn into office on January 20, 2001, re-elected on November 2, 2004, and sworn in for a second term on January 20, 2005. On Tuesday September11,2001 two hijacked planes slammed into the New York's World Trade Center , destroying the twin 110-story towers.A third plane crashed into The Pentagon in Washington, D.C.A fourth plane crashed in Western Pennsylvania. It is reported that passengers fought with the hijackers preventing them from completing their mission. Saudi dissident Osama bin Laden, warned three weeks before the attack that he and his followers would carry out an unprecedented attack on US interests for its support of Israel. After the September 11 attacks on the U.S. in 2001 destroyed the World Trade Center and part of the Pentagon, the U.S. attacked Afghanistan's Taliban government for harboring and refusing to extradite the mastermind of the terrorism, Osama bin Laden. The War in Afghanistan, which began on October 7, 2001 as the U.S. military operation Operation Enduring Freedom, was launched by the United States with the United Kingdom in response to the September 11, 2001 attacks. The stated purpose of the invasion was to capture Osama bin Laden, destroy al-Qaeda, and remove the Taliban regime which had provided support and safe harbor to al-Qaeda. The United States' Bush Doctrine stated that, as policy, it would not distinguish between al-Qaeda and nations that harbor them. The war is ongoing. In 2003 the U.S. attacked Iraq, with British support, and overthrew the government of Saddam Hussein. In 2006, a boom in U.S. housing prices abruptly reverses course; between the fourth quarter of 2005 and the first quarter of 2006, median U.S. housing prices fall 3.3 percent. These declines accelerate in 2007. The downturn prompts a collapse of the U.S. subprime mortgage industry, which offered loans to individuals with poor credit or no cash for a down payment. More than twenty-five subprime lending firms declare bankruptcy in February and March 2007. The collapse rattles the Dow Jones Industrial Average, which on February 27 loses 416 points, or 3.3 percent, its biggest one-day point loss since 9/11. In September 2008 Lehman Brothers, a major investment bank and a fixture in the U.S. financial sector for more than 150 years, fails to find a buyer and files for bankruptcy on September 15, marking the largest bankruptcy in U.S. history. Treasury Secretary Henry Paulson unveils a rescue plan dubbed the Troubled Assets Relief Program, or TARP. The plan aims to use $700 billion of U.S. taxpayer assets to stabilize markets. With equity and credit markets both reeling, the U.S. Federal Reserve moves on October 6 to make an additional $900 billion of short-term lending available to banks. In November 2008 The United States announces 240,000 jobs were lost in October 2008, the first in a series of announcements of heavy job losses that continues into 2010. On February 17,2009 President Barack Obama signs a $787 billion stimulus package into law. The bill aims to boost vital sectors of the U.S. economy, including energy and health care. On august 31, 2010 the American combat mission in Iraq ended. There are still 50,000 U.S. troops still deployed in Iraq and are now designated as "advise and assist brigades" assigned to non-combat operations.